Outside an early voting site in St. Paul Monday, it wasn't easy to find a parking spot. 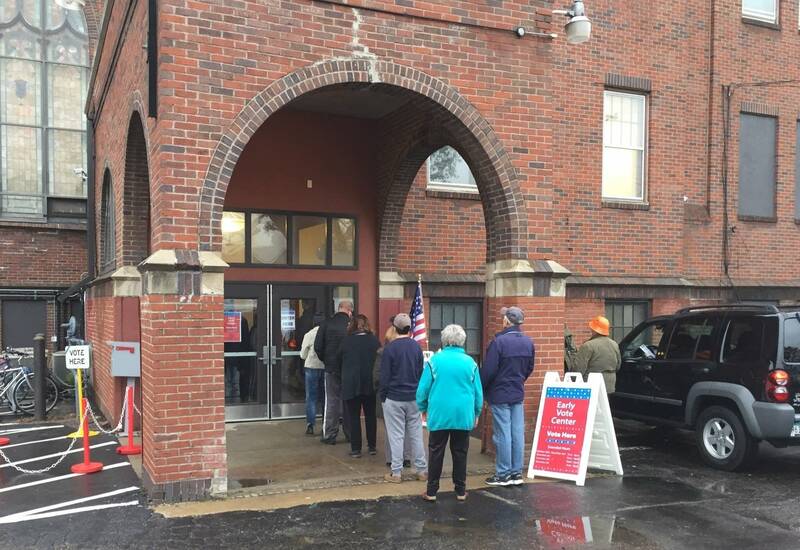 Inside, a steady stream of people waited briefly for their turn at a couple of dozen polling stations before they could fill out an absentee ballot on the spot. It's been like this for weeks, including Sunday when 750 voters came through in a matter of four hours. "The line was long enough that the wait time from the end of the line to our counter was 25 minutes. 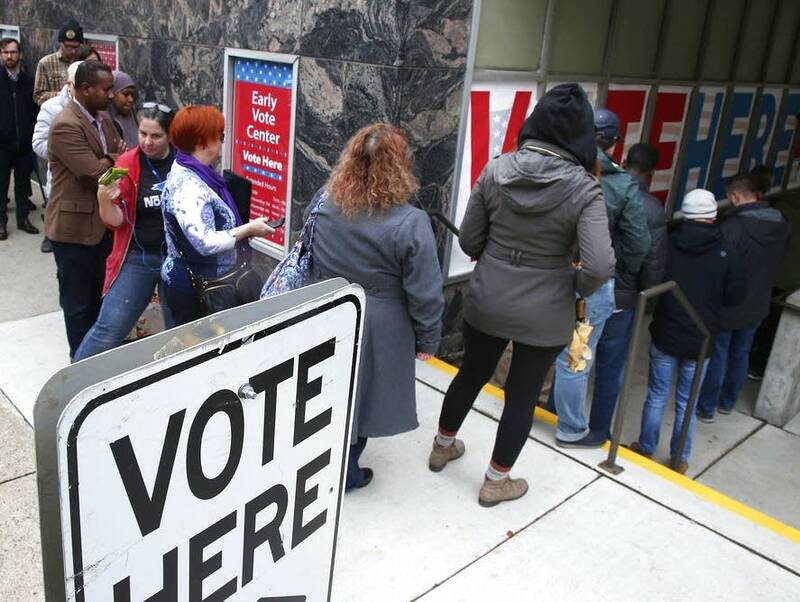 That tells you the kind of interest there is," said Ramsey County Elections Manager Joe Mansky. With one eye on the weather forecast and another on the campaign finish line, Vicki Frascone added her ballot to the more than half million others that have come already in Minnesota during this midterm election, a torrid pace rivaling the last presidential election. "I'm tired of the ads, the slamming on the radio, the TV, everywhere," she said. "I just want it done. Why can't they run a nice campaign, go on their issues instead of the backstabbing and picking everybody apart for the bad things that they allegedly, supposedly did." It has been this way because Minnesota has so many big races. Voters will elect a new governor and attorney general, pick who fills two U.S. Senate seats, decide nationally watched U.S. House races and determine which party runs the state Legislature. Candidates for all of those offices were out in force Monday. The statewide candidates on the DFL ticket held get-out-the-vote rallies at campaign offices around the Twin Cities. The party's candidate for governor Tim Walz told volunteers to dig deep in these late hours. "What clearly the closing arguments in this governor's race is about is they have misread Minnesota as bad as they could. They're telling us we're fearful and afraid. Well, Minnesotans don't fear the future. We create it," Walz said. "Go create it." The Republican candidate for governor, Jeff Johnson, began his day in western Minnesota and was hitting several events on his way back to the suburbs. He's shaking hands in restaurants along the way and filmed a Facebook video in a hardware store in Pelican Rapids. "This is the easy part of politics," Johnson said. "I'm not raising money anymore. I don't have to worry about strategy or anything popping up that we weren't expecting. You just get to go talk to people now and share a message. And it's good. I enjoy this part the most." Back at the St. Paul polling place, Mansky cautioned about reading too much into the early vote numbers. "My impression is that we are likely poaching voters from Election Day, which is actually fine for us because that makes the Election Day environment easier for both the voters and election judges," Mansky said. Still, he's expecting overall state turnout to approach 60 percent. That's higher than the 50 percent of eligible voters who cast ballots in Minnesota four years ago. "You know controversy is good for our business," he said. "And there is a lot of controversy here today." Early voter Ben Larson said he's ready for a respite from campaign season. "It just seems to kind of invade you at all times," he said. "It's still going to be crazy I realize, but just tone it down for maybe of couple weeks would be good." For some voters, though, this election is a milestone. Dominique McGowan posed for a picture with 15 fellow students ranging from 18 to 21 years old. They had just cast their first-ever ballots. The students studied up on the issues before coming down to vote. "At first I thought it was going super stressful," she said. "But I'm glad I did it though."